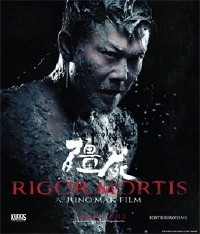 Rigor Mortis comes from writer/director/producer Juno Mak and producer Takashi Shimizu and reunites some of the original cast members of the classic Mr. Vampire series. Rigor Mortis is set in a creepy and moody Hong Kong public housing tower whose occupants we soon discover, run the gamut from the living to the dead, to the undead, along with ghosts, vampires and zombies. The film stars action movie veteran Chin Siu-ho (Siu-ho) as a former vampire hunting actor who now finds himself reaching the end of the line as a washed-up star who is also separated from his wife and alienated from his son. No word on American distro, but we'll keep you posted on this insane looking flick. Looks like an Asian Nightwatch, cool.